Welcome to the Carnival of Homeschooling: Bee Edition. The gorgeous photo you see above is a Diane Varner special. I fell in love with it last week at Thursday Challenge and had to include it here. She’s a brave lady to get that close, but I’m so glad she did! “So, what’s a carnival?” you ask. A carnival is a place where bloggers of a like-mind or a similar group can showcase their most important, funny, interesting, or otherwise groovy posts so that YOU will go seek them out and read them. Each link is a teaser to lead you on your merry way through the internet to the blog where it originated. I’m just the host this week… and while I host, I get to include a lesson about bees and some of my favorite graphics. The reading material is really in the form of other people’s blog links, so I hope you will click a few and go read what these great homeschool moms have to say! 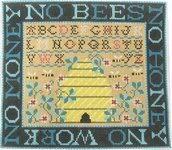 This little honey jar graphic is from one of my very favorite bee-ish sites on the net: Bee Creations. I hope you’ll stop over and check them out. Their website is amazing. Honey (‘bee spit’ as we so affectionately call it in my home) is sweeter than sugar and so much better for you. It has long been associated with health-benefits. Aside from dormant endospores of the bacteria ‘clostridium botulinum’ which could be harmful to infants, honey is known to inhibit the growth of microorganisms and has a very long shelf-life. Honey is the source of food for the bees during the cooler months when flowers are not as plentiful. Honey contains many essential vitamins for humans (unlike other sweeteners). Raw honey is preferable due to the fact that it contains enzymes for digestion and antioxidants. It is also believed to cure allergies in those who regularly eat it (if the honey is from the same general area where the person lives and is raw). LEARNING. That is top on my list of benefits with homeschool. Seems that I’ve been able to re-learn or just learn (for the first time) all of the things I missed out on in public school while I’ve been “teacher” to my kids. A lot of times I feel like more of a co-learner than a teacher (and sometimes the kids are even the teachers!). Denise at Let’s Play Math agrees! She sends in her “Are you a homeschooler?” Quiz and comes to the conclusion that I have… homeschooling creates a honeycomb of life-time learning. Another beenifit to homeschooling is the extra time your kids will have for just being kids. Like our recent fishing field trip, most kids these days at public schools just don’t have time to PLAY anymore. Barbara Frank sends in a post for the carnival that talks about a new book that is making a buzz in Britain. Remember when boys were allowed to be boys? When they had time to fish, tie knots, build treehouses and make go-carts? Seems like this book is promoting the idea that boys should still do those things – even when modern feminist culture is pushing the degenderization of the sexes. Go check out her book link and read her post entitled “Letting Boys Be Boys“. 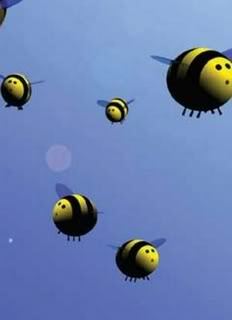 Drone bees are the males of the hive and their sole purpose is creating baby bees. Once they mate (only once), they die. They don’t have stingers, either. 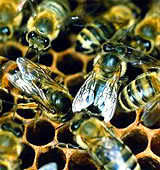 In a hive, there are usually hundreds of drones and one queen who are responsible for creating all of the offspring. 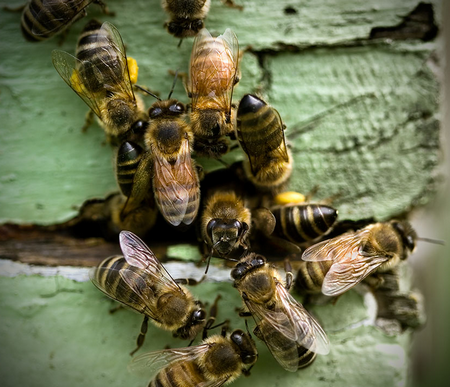 There are usually thousands of female worker bees; and interestingly enough it is the females who protect the hive and do the rest of the hard work. It is good to have a worker bee watching out for the rest of the hive. Consent of the Governed is on the lookout. She shares a letter she received in the mail that foreshadows possible homeschool teacher education requirements in the future. Keeping up with the current culture-trends is another big worker bee job. Gena at Home Where they Belong not only has a lovely video linked up on her blog header that seeks to encourage homeschoolers that they have made the right choice; but she also keeps tabs on current events for us. This week’s post she submitted for the carnival is entitled, “The Queen, no wait, King, no that’s not right, Royal Highness of the Prom“. Bees are social insects. They live in colonies that may number 80,000 or more. 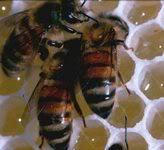 New colonies are created when certain selected female babies are fed Royal Jelly causing them to become queen bees. After they mate with one of the drones, they fly off with a handful of worker bees to start a new colony. “Planning a Homeschooling 101” Class isn’t so hard. SmallWorld shares her extensive list of ideas to plan just such an event. You never know who is searching for support out there. If you have been homeschooling for any length of time, you have something to offer a newcomer – even if it is just some encouragement for the journey ahead. Melanie at HomeschoolHelpWeb gets extra bee-brownie-points for her effort to add to the theme for the carnival this week in her post: “The Beeatitudes of Homeschooling“. I have to agree that God’s Word is a manual for our whole lives (including our homeschooling adventure). Thanks for the play on words and the encouraging thoughts, Melanie! If you do find that beeatitude bee from the days when we were kids, please email me a copy of him! I collect bee graphics (as you can see). Want to know “How to Keep Homeschool Kids Busy”? Mom is Teaching knows how. She lists her top 10 ways for the many visitors to her site that have ‘googled’ that phrase lately! Lindsey of Finding Contentment in the Suburbs shares how to save stores of honey money in her post entitled “Homeschooling Frugally, Tips & Tricks Series“. Tia of High Desert Hi-Jinks shares a cute parody between homeschooling and homecooking. Get some laughs at her site and read her “I’m a Homecooker!” post. Her entry came with this funny tagline: “There are those that think homeschooling needs to be more regulated. How far behind can regulations for cooking for our own children be?” She cracks me up. One of the most interesting things about bees is how they cool and warm their hives. The worker bees must keep the hive a constant temperature to ensure their survival. From late winter to early autumn the bees must keep the hive from 91-97° F. When it is hot, they fan their wings and bring in water for evaporation and for thinning the honey to feed to their young. This protects their unborn workers. In the colder months, they must keep the hive above 50° F. Temperatures below this are lethal to the bees. To keep the hive warm, the bees practice flexing their wings to create heat, they swarm in a circular fashion and they gum up holes and cracks in their hive with plant resins. What amazing little creatures! No two bees are the same… er, at least no two kids are the same… especially when it comes to learning styles and life experiences. Lynn of Eclectic Education posts about “Homeschooling Special Needs Children” and shares a list of links to research different problems that kids might have to overcome. I like her medical binder idea (as I tend to be a binder-nut and list-maker myself). Prepare to be blown away. Homeschooling Aspergers shares her “Application Example for Home Education Registration in Queensland”. Although I’m glad that I don’t have to fill out paperwork like that for my homeschooled students, it was thought-provoking reading. Do you know any homeschooled children with Aspergers? Be sure to stop in and say ‘Hi’ and welcome them to their new homeschool journey in lovely Queensland, Australia. “TO BEE or NOT TO BEE” – THAT IS THE QUESTION. There are many insects which mimic bee markings. Hover flies and robber flies are a few that come to mind. Bee Killers and Robber Flies kill honey-bees. Have you ever see a huge bumble-bee-looking fuzzy insect killing a honey bee? If you have, you encountered a Bee Killer. Check out the link to ‘What’s That Bug’ in my credits section if you want to see what they look like. There are some amazing photos (some even with honey-bees in their death grip!). Just4homeschoolfamilies (who just won the Best Variety in the Homeschool Blog Awards, by the way) shares a very down-to-earth post (“Breaking Tradition“) about her ‘homeschool philosophy’. WHAT??? You don’t have a homeschool philosophy yet? Well, go read her post and maybe you’ll identify with hers! Mother Crone’s Homeschool is cooking up an education. Aside from her chic web design (I covet those green dots)… she has an interesting and thoughtful post about the ‘down-side of total unschooling’. She adopts the term “’Child-Led, Mom-driven’ Education” for her style of homeschooling. Stop over and read why. Perhaps my favorite bee story in children’s literature is told in ‘The Golden Sleepy Book’ (my very favorite childhood book) by Margaret Wise Brown (Illustration by Garth Williams). No children’s library is complete without it! It is the tale of a little bunny that accidentally swallowed a bumble-bee and had to make the tiniest sound he could think of to make the bee come out and fly away. Margaret Wise Brown is the same author who brought us “Goodnight Moon” and droves of other wonderful children’s books in her very long career. Although she died over 45 years ago, her books remain timeless treasures for children everywhere. Scribbit shows us some simple and effective ideas on how to increase our children’s love of reading in her post “More Tips for Improving Your Child’s Literacy”. Headmistress, Zookeeper at The Common Room is busy “Talking About Books”. She champions the cause for narration. I love this quote, “Telling somebody else what you’re thinking about actually improves the way you think.” Wow. That means blogging really is worth something after all! Thanks, Headmistress Zookeeper! “An Act of Affirmation” By Laureen (one of the members of Life Without School) shares a touching story about how we can encourage the heart of a child and give them wings to fly to new heights. Laureen’s son has begun reading on his own and a kind and enthusiastic praise from Grandma has given him new courage to begin reading to his little brother (and truly believing in himself). Way to go, Rowan! Maybe one day he’ll even be a blogger?! We can hope. Reading is great, but so is writing. I’m sure you bloggers out there will agree that some of us who think in words have no release without a way to get it all out! Teaching the young bees to write is very important. Jennifer of Jennifer’s Nest has some great tips on how to get your younger reluctant writers in the mood to journal in her post entitled “First Journal Success“. Becoming computer literate is as important as learning to write these days. Suni from EternaLearning Academy talks about how to prevent your children from becoming victims of cyber-stalkers through early technology training in her post entitled “Child hackers and learning computer functions”. The Campus Grotto shares “Free Software for Students“. Your teens and college-aged kids will be sure to want to check some of these out. One of my favorite free programs wasn’t on the list! One of the ways technology can be used is to create a little hive of our own. Homepages, blogs, blogrolls and this very carnival are all ways we can manage to come together with like-minded folk – even out here in the wild blue yonder of cyberspace. Henry of Why Homeschool reminds us all that “The TTLB’s Homeschooling Community is active again“. Truth Laid Bear’s homeschool group is like an ongoing carnival of homeschool posts that requires no extra effort on your part (sounds good right about now)! Stop over and check it out. Are you a gardener who wants to ADD some bees to your yard? You can attract them with blue, purple, yellow or white flowers. Some favorites of the nectar-mongers are lilacs, honeysuckles and azaleas. Bees also love herbs such as mint, lavender and thyme. They avoid flowers that have had the nectar and pollen bred out of them (like many contemporary rose breeds). “Yay for Cuisenaire Rods”! Mama Squirrel at Dewey’s Treehouse is singing the praises of Miquon Math. Join her as she explains the complexities of hands-on math education for a five-year-old. Sometimes adding up the credentials only leaves you with a big hill of beans. Dana of Principled Discovery shares a thought-provoking post about what being a good teacher really means. In “Educational experts and homeschoolers“, she shares a great quote from a college teacher saying that his homeschooled students are the best thinkers and writers in the class. I enjoyed what Dana said best, though: “…degrees and titles do little to make anyone a better teacher. It has more to do with a passion for teaching, and the freedom to follow that passion.” Amen to that. Homeschooling Journey reminds us that we don’t need to overlook art in our homeschool education. Check out her post, “10 Ways to Explore Art With Your Child” for some ideas on how to incorporate art into your lesson plans. What a splendid post Bioluminescence has offered for this week’s carnival. It is the milk-and-honey for today: “A More Ancient Mariner“. What do I love so much about it? Poetry! Bees (get a load of that strikingly bee-utiful photo)! The mention of ships at sea (which happens to be the unit we are studying right now)! If you listen closely while you read it aloud in a throaty voice to do it justice… you’ll hear the shifty Mariner B. talking to me (Heather)! My mama warned me about bees like him. Napoleon Bonaparte declared himself emperor of France in 1804. He refused to allow the pope to crown him and placed his own crown on his head. Napoleon’s corronation robe was replete with embroidered bees as a symbol (taken from Merovingian kings of the past) of “‘a republic with a chief’, with a sting but producing honey”. There is even speculation that the French fleur-de-lis originated as the graphic outline of a bee (taken from the emblem of Childéric, a Merovingian king). Louis XII used a beehive as part of his coat of arms, “but the National Convention rejected this emblem for the Republic, ‘because bees do have a queen. '” The bee was a symbol for the French between 1804 to 1814 in the First Empire, during the Cent-Jours (1815) and also in Napoleon III’s rule during 1852-1870 in the Second Empire. Trinity Prep School shares her unique history lesson plan method in “Tenative History Studies“. She’s added quite a few links to the books she has chosen for the coming school year in this post. Looks like a lot of great reading ahead for her kiddos. Alasandra shares some notes she has taken for a “Civil War Unit” that she plans to teach next year. She welcomes your input and ideas, but it looks like she has plenty of good information to cover. Raising awareness about the plight they are going through these days could save many bees from the endangered species list. Does that sound like Science Fiction to you? Do the math to discover how very real the decline in numbers of bees around the world is! Not just honey bees are in the line of fire; bumblebees are also facing extinction. Bees in many countries (France, Italy, and even the USA) are facing extreme mortality rates and entire colonies are dying off. Some people believe that it is due to mobile phones; however, I suspect that genetically altered crops and pesticides are the real killers. The sad thing is, the bees are connected to us in so many ways. If they go, eventually… we all go. Need a homeschool link? The queen bee of All About (my) Boys shares a huge “list of links” with us. There’s something for everybee. Join All Info About Homeschooling at the dinner table to discuss “Logic for the Younger Ones”. Waldorf Our Way discusses “Learning Opportunities” and how she feels that turning teacher-mode off once in a while isn’t such a bad thing. Stephanie presents “Our OBX Vacation” posted at Adventures in the 100 Acre Wood. Come take a virtual field trip with her gang and see the wild horses on the beach. Of course you KNEW that I was going to add this field trip in here, didn’t you? Yes… Sprittibee‘s gang offers: “Field Trip Foto Friday – Honey Bee Farm“. It is an older post, but I couldn’t resist. If you haven’t seen my many field trip posts, they are my favorite part of this blog (and our homeschooling). One day soon, I’ll be adding another whole year’s worth of them to my Homeschool Series. “Bees, Flowers, Nature…How to Celebrate Spring” is a plea for help from a control-freak mama who truly desires to JUST ENJOY her kids and homeschooling. Jenny at Little Acorn’s Treehouse is looking for ways to let go of the rigid schedules and worksheets so she can soak up the smiles. Stop in and give her some hugs and a morsel of advice if you have some. As if in answer to Jenny’s question… in came “Homeschooling and the spring wiggles/ year-round homeschooling.” from My Domestic Church. Seems that she – like me – has gotten tired of the pressure of fitting in a box and getting things done exactly on a public school schedule. It works for me much better taking a little extra time for fun along the way and doing school when we are at our best (with our minds inside the classroom and not out among the beckoning flowers)! “Afternoon Tea and the Hard-Working Mother” is Wellspring Tea’s ode to the homeschool mom who needs to remember to plan a few breaks in to her schedule (I’ll be checking this one out promptly!). A spoonful of honey, anyone? Not everyone is feeling busy and excited this spring. Some homeschool bees are in a “Spring Slump”. No Fighting, No Biting shares some practical advice to help those burned out bees get their buzz back. Some bees have a hard time getting on schedule. The Thinking Mother muses over her difficulty in sticking to a chore schedule in her post, “Daily Chores Update“. Ever wondered what a homeschool student thinks about when they are asked about their accomplishments? What a great glimpse into the minds of our children and honey for my ears: “Measure not your life–or your children’s lives–in SAT scores and resumes. Measure it, instead, in the fullness with which you have walked God’s path for you. Measure it in relationships, in family, in joy, in passion, in true learning.” – Inklings, “Not Your Average Bio”. Thanks for joining us this week for the Carnival of Homeschooling. I hope you enjoyed the sweet and sticky line-up. If you’re interested in submitting to the carnival or finding out more about the Carnival, you can check out this carnival invitation post that has links to all of the most important places you should go. Please leave a comment and be sure to link to the carnival on your blogs to lead everyone to the honeycomb. Graphics for this page have come from various sources. All credit has been given where due. These are personal graphics and are to be used for personal use only – many of them are subject to copyright. No bees were harmed in the making of this post. WOW! This is THE BEE’S KNEES! (My dictionary says this phrase means an outstandingly good thing). I must get to bed immediately, but will read all about it over the course of the next several days. Truly an exceptional job you’ve done! A wonderful job! Thanks for hosting. Hey that was sweet (as in honey!!) sprittibe! Thank you!! Thanks for hosting. My brain isn’t working this morning, I couldn’t get the graphic to work. Maybe around lunch time after a few cups of coffee I’ll remember how to do it. Sprittibee, the link to my post doesn’t work. Here is the correct link. Don’t worry, after having hosted a Carnival I know how hard it is to get everything right. Awesome job on this carnival. 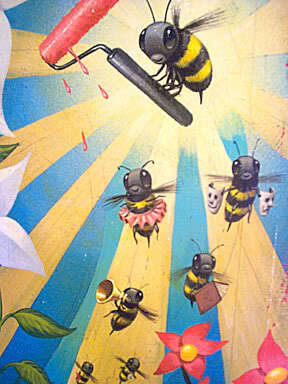 I love all the bee art! Hey this is fantastic. You did a great job. This is a great Carnival – thanks for all the hard work! It’s beautiful! Thank you for the carnival! It looks like there is plenty here to keep me browsing the rest of the week. Unfortunately, I’m going to have to decipher many of your links manually. Nearly half of the links I clicked had your blog, and then some gobbledy-gook like “%E2%80%9”, and only then the linked blog post—all crammed together into one link. No surprise, I got a lot of error messages. I just wanted to say “thanks” for all your emails! It’s funny how I even stumbled upon your blog to begin with. I told you I would pray about it and start with some summertime units this summer and see how things go. Well, we all know that God works in mysterious ways right!?!? Well, guess what….of all things – bees are invading our house!!!! They found a way in a vent hose by our master bathroom!!! So, thankfully they can’t actually get to us. Boy, does God have a sense of humor or what?! LOL!!! I’m still putting everything in God’s hands and letting him be my guide. I’ll “bee” sure to keep you posted! Thanks for a great carnival – lots of great info for our family! Having never bee-n to one of these carnivals, I am blown away! Thank you for all your hard work! By the way, I’ve been eating “local” honey for the past month, and my allergy symptoms are almost non-existent even though Georgia is having an unusually high allergy season! Go bees!!! Alasandra – 🙁 No graphics? Oh, it is much, much better with graphics. Denise: I fixed the links! Sorry. I used MS Word to put the post together and it sometimes adds extra quotes around them – which the browser freaks out over. 😉 Hope they are all working now. It is 11am! Thanks for including me! This was my first carnival! 🙂 I just wanted to let you know that you did a really great job. I love the bee theme and it is so, you! Okay so its already been said but you are THE BEES KNEES! 🙂 way to go!!! Love it. Wow! What a GREAT job! I’ve learned so much about Bees! I can’t wait to sit down with my cup of coffee and read all the wonderful mentions of the different blogs. How fun! Thanks for hosting. Thanks Lynn !!! 😉 Great job on your first carnival. OH NO, JILL! The poor bees!!!! Thanks for your awesome info. BEE sure to stop back by. Hope your bees recover quickly. Valerie – Thanks. Glad you liked it. 🙂 This was a fun topic to write on – well worth the effort. Michelle – I agree with you that honey works on allergies! I also have had it help with sinus trouble if you take a tablespoon of honey with a teaspoon of cinnamon. That is also the same recipe for a rub for rashes. It helped my daughter’s rash. Of course, you have to sleep in a long sleeved and long-legged nightgown and PEEL it off the next day because it is so sticky… but it is great for your skin. It is almost like an antibiotic. You probably know that bees are dying by the millions right now, and the experts aren’t exactly sure why. This concerns me because I distribute a line of premium honey products in my area, and the implications on crops in the future. Several young readers have reported that reading one of my Christian, action-adventures & mysteries is like being in an exciting or scary movie. This comes from my extensive background of dramatic film and video production. My books are first targeted for boys ages 8 – 13. But girls like the books also. Books are ranked by Accelerated Reader. They can be ordered from Baker & Taylor, or at Amazon.com. Great, great carnival this week! Thanks for all your hard work. I love it! You’ve done a beautiful job :). Glad to bring a little “honey” from a graduate’s perspective… I shall cheer homeschool parents on while I have breath :). ‘Honey’ – you’ve done an awesome job with this carnival! It looks awesome! I have to say that I nearly spazzed when I first opened your page and heard the bee buzzing. I was frantically looking for a little fuzzy invader in my living room! LOL! great carnival! i’m checking out many of the links now. Awesome, Heather – you did a fantastic job. I love the bee graphics, they’re all SO cute. Max – Hope your premium honey products (and the bees who help to make them) remain healthy and profitable. The rest of your comment sure looks like an advertisement, however! If you have something interesting you want us to look at, just be up front about it. Bev – I would have spazzed too – I’m afraid of flying insects for the most part. Someone told me that bumblebees can’t sting and you can catch them in your hand. HA! I’ll let her go first! Thanks Carrie. 🙂 I love the bee graphics. Anyone can feel free to send them to me via email if you find good ones! Bee sure to set aside a day or two for all those links, Chickadee. 🙂 My mom is “Chickie” to my kids (instead of Grandma). We are always buying little chick things for her. I just got her one of those soft Easter chicks half-off at Starbucks. Bunny Trails: Yes, I love the graphics, too. 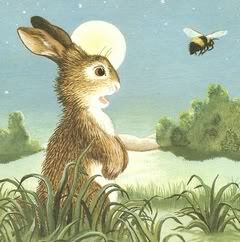 I actually scanned the bunny and the bee from our Margaret Wise Brown book. I looked and looked online and couldn’t find anything… except the newer version of the book with some other illustrator. It is so sad to see these classic children’s stories being re-done with new illustrators. I’m all for allowing new books to have new illustrators, but the book publishers should retain the original illustrations for reprints of older stories. Part of the magic of the older stories was the illustrations that went with them. 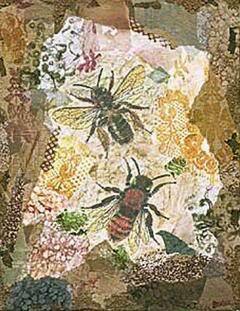 My first intrigue with bees came from Margaret Wise Brown’s bumble bee drawn by the talented Garth Williams. 🙂 I want to paint a copy of it on a wall some day. THANKS FOR ALL YOUR SWEET COMMENTS!!! Thank you so much for your kind words and your advice. I am continuing to pray about how to simplify our schooling and our home. I just finished reading through the carnival and found many great articles. Thank you for your hard work! GREAT— like I already said… just wanted to point out.. the bee sound here gives me a heartattack each time! My poor little heart is POUNDING away and I can;t breath well… Makes me wonder what happened in my childhood that was so tragic! Thanks for the pleasant waltz (bee dance?) through the carnival. The bees are disappearing in the UK, too. It’s a strange and scary phenomenon. How do you pronounce spirttibee? Thanks for the fun posts. Lots of encouragement. Reminds my of Warren W. Wiersbe books (Be Victorious, Be Available, Be patient, Be Mature, Be Comforted, Be Committed, Be Decisive, Be Skillful, Be Strong, Be Obedient, etc) . My little Wonders: Thanks for the comment. Don’t ever hesitate to email me if you need support or questions. Dreama – 🙂 Thank-you Mam. How sweet of you. I feel like a ring master around here sometimes… my house is sometimes very much like a circus! Redbud – Those flowers look like bluebonnets. You are in the UK? Do you have bluebonnets there too? Are you from TX? Just curious. Heart of Wisdom – You are putting an extra I in my name (which is why it seems so hard to pronounce). Think of the drink SPRITE. SPR+ITTI (like itty-bitty), and BEE. It is a nickname my husband gave me back when we were dating. 😉 Pretty with an S in front. Wow. I had no idea you could whistle to a bee. Thanks for the verse tip! My, oh my, this is a lot of reading! I’m going to have to come back later and work my way through it. I’m showing my total newBEEness in the carnival of homeschooling arena, because I read about it ahead of time but foolishly thought I needed a bee theme, too. What was I thinking?